Just a short leisurely drive into the country will lead you to "THYME"....we offer three fine dining options, spectacular overnight suites, and executive suites for extended stays. If you are looking for a unique evening out on the town, or a special weekend getaway to the country, THYME will make your experience a wonderful one with memories to boot. We look forward to having you as our guest. Sign up for great promotions. A little slice of Europe with scenic murals and old world ambiance. Casual dining at it's finest....we look forward to serving you. Our family-oriented seafood market and restaurant complete with an up-scale, raw bar....come on in and relax. 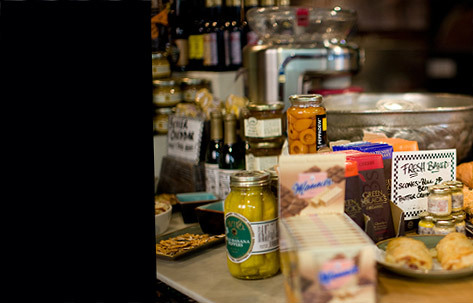 A European market with an extensive selection of take out sandwiches, entrees, breads and desserts....delightful! Upscale, luxurious overnight suites and beautifully appointed executive suites....why settle for the ordinary?